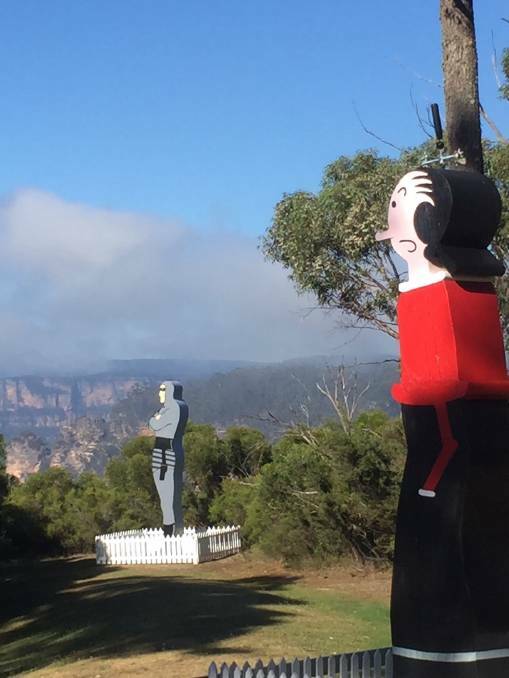 Boofhead and Olive Oyl, long term guardians of the Leuralla Amphitheatre, have been joined by the imposing figure of the Phantom, standing sternly overlooking the escarpment. 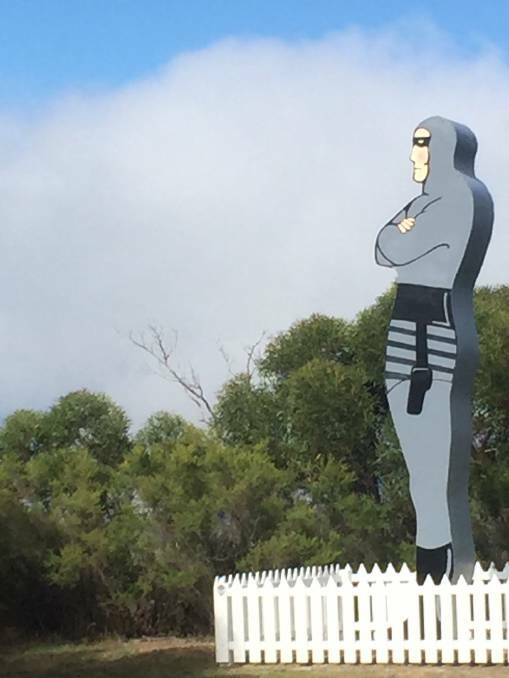 The five-metre figure was commissioned by owner/ directors of the NSW Toy and Railway Museum, Leuralla, Clive and Elizabeth Evatt and inspired by the Images of this eternally popular and stern guardian of peace, as embodied by Sydney artist and Phantom aficionado, Peter Kingston. Working from Kingo’s models on display at the Museum, this labour of love was undertaken by local craftsman Russell Hunt, taking over a year of planning and commitment. His work, assisted in the final stages by Kingo, exceeds all expectations as revealed by the imposing stance of this, the first of the caped guardians of peace, fighter for the just, forerunner of the superhero, reliant only on personal strength, intelligence, integrity and reputed immortality to right the wrong and pursue and defeat the perpetrators of evil. The unveiling is timely as the Phantom, creation of Americans Lee Falk and Ray Moore, first appeared in comic strip form on February 17, 1936. The Phantom was an immediate success and soon had an international following which in the 82 years since had grown immensely. The comic strip is now syndicated to more than 500 newspapers worldwide with continuous publication of the popular and widely read comics. The Phantom has inspired artists worldwide and most recently a travelling exhibition in 2017 featuring the work of many Australian artists including Kingston, toured Australia, finishing with a highly attended show at Manly Art Gallery, curated by Ross Heathcote. Leuralla NSW Toy and Railway Museum is open daily 10am-5pm. More information at toyandrailwaymuseum.com.au. Leuralla Amphitheatre is available for weddings and events; see leuraweddings.com.au. See original story at the Blue Mountains Gazette website here.